couldn't believe that it's already been so long since I reviewed power cord Robusto by Sablon Audio – that happened in 2011, so it's been already more than 4 years! I remember very well the cable, how it looked like, and I remember also its creator - Mark Coles. Now, looking at his latest, top model of power cord, it seems that some things just don't change. Like the look of the cord – it's still a bundle of copper wires inside dielectric, with a sleeve, similar plugs and heat shrinks with company's logo on them. So at first one can't really see what one pays quite a lot for. The price comes from the way cables are made. They are hand-made using several, often quite uncommon, techniques. The most expensive model, Corona Reserva, sports thick bundles of wires with a separate protective bundle. Some elements are covered with some sort of a lacquer that minimizes noise – manufacturer does not inform exactly which elements are these. The name of this lacquer – „Magic” – makes lives of „haters” easier, and ours more difficult as it tells us nothing at all. It seems that cost are divided evenly between cable and plugs. 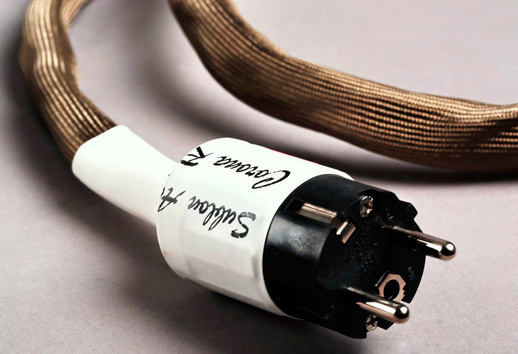 Mark terminated his top model with expensive plugs – for European market he used Oyaide Shuko plugs, model P004/C004. Metal elements of these plugs underwent cryo-treatment. They covers sport crystals that damp vibrations and RF radiation. This is a direct link to Japanese filters RAS-14 by Acoustic Revive. It seems that Sablon used the same materials as the ones that were used for this particular filter – it is mentioned in company's materials. Corona Reserve seems to be a combination of a power cords with integrated, passive filter. 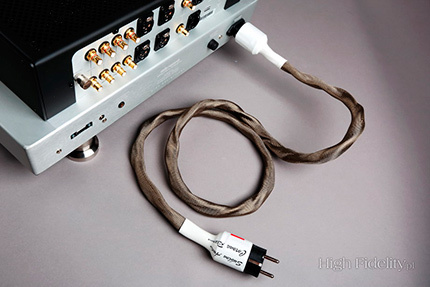 Cables undergo initial break-in in Audiodharma „high power cooker”, saving users a lot of time. Just to give you a full information Corona line includes three models (starting from the most expensive one): Corona Reserve, Gran Corona and Petite Corona. The model under review replaced in company's portfolio previous top model called Quantum Gran Corona. It has been some years since you reviewed my Robusto power cord and the new Reserva Corona represents several model iterations of development. Changes to the overall gauge, conductor geometry and cryogenic treatment saw the original Gran Corona cord gain in neutrality and transparency over Robusto. This greater bandwidth caused the original plugset to become a limiting factor and allowed the superior Oyaide plugs to uncork the innate performance potential. After some further noise reduction tweaks, I concluded that I had reached developmental limit of that particular conductor. Reserva Corona uses the same Oyaide 004 plugset and noise reduction techniques as before but is now based upon a higher specification wire in a different hand-built geometry. This also allows for lower weight / a slimmer form factor with far greater flexibility and a more upscale appearance. 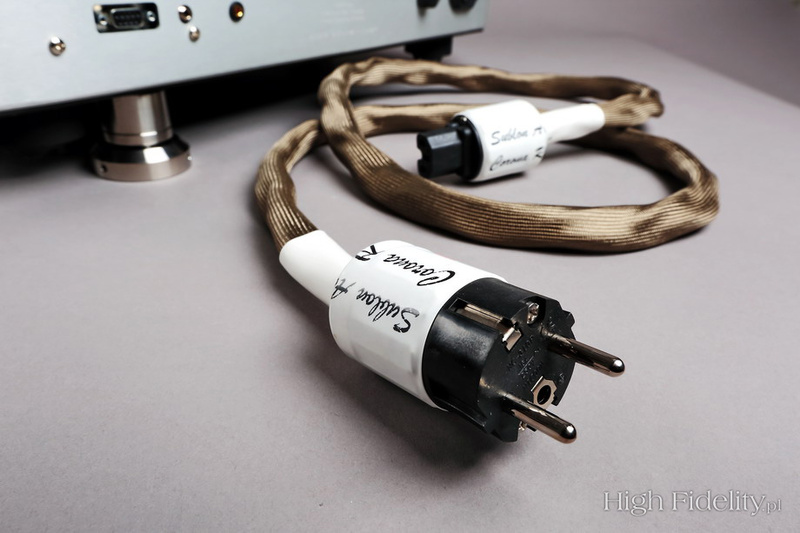 From a sonic perspective, the evolution of the Sablon power cords has achieved considerable gains in transparency, detail, dynamic range, greater extension at both frequency extremes and a more even tonality. Robusto undoubtedly had a strong character which delighted some but did not work universally. Reserva is however much more neutral and its transparency will let you know precisely what your underlying system sounds like. Miracula. Medieval Music for Saint Nicholas, wyk. Ensemble Peregrina, Agnieszka Budzińska-Bennet, Tacet 213, CD (2014). Carmen McRae & July London, Carmen McRae & July London Bethlehem/Victor Entertainment VICJ-61458, “Bethlehem K2HD Mastering Series | No. 8”, K2HD CD (1954/2007). Duke Ellington, Concert in the Virgin Islands, Reprise/Warner Bros. Japan 8122-79598-0, “Jazz Best Collection 1000 | No. 4”, CD (1965/2013). Elton John, Goodbye Yellow Brick Road, Mercury Records/USM Japan UICY-40025, Platinum SHM-CD (1973/2013). Shankar, Songs For Everyone, ECM Records ECM 1286, “ECM Touchstones”, CD (1985/2008). Vangelis, Blade Runner, soundtrack, reż. Ridley Scott, Atlantic Records/Audio Fidelity AFZ 154, “Limited Numbered Edition | No. 2398”, SACD/CD (1982/2013). Power cables sound different (or change the sound in different way) in every system, at least as long as it offers decent performance. There are those who claim that improvements worth spending a lot of money on power cables are reasonable only when one already has an expensive system. And they are mostly right about it: changes introduced by power cables happen on so many different levels, also very deep ones, that changing only few (classic) component would cause comparable changes. But I also tried switching regular cable offered by a manufacturer together with a 1000 PLN amplifier to an “audiophile” one for 300-400 PLN that did wonders to device's character. So I treat changes introduced by power cables as something “normal”. That doesn't make it any easier for me to understand why such inexpensive device react so strongly to cables that cost 10, 20 even 50 times more than those devices themselves – and I know they do react, as I tried it many times. It is like the amplifier for, say, 1500 PLN had a secret potential only waiting for opportunity to be revealed. To be clear – there is no magic to it, it's pure physics that is still waiting for proper explanation and backing with measurable proof. But power cables changing sound is a fact, it is clearly audible regardless of the price of a cable and of a system it is used in. And it is possible to assess and to describe these changes. Mark Coles's cable is a perfect example – it is really easy to describe changes it introduces. It belongs to those audio components that connect. I mean, obviously, the influence on the sound and not just connecting component to power. Corona Reserve fills space between sounds connecting them into a amazingly fluid wholeness. Sablon's presentation focuses on the middle of the soundstage. It doesn't take much time or effort to notice that but it is worth taking some time and making some effort to understand why it is so. 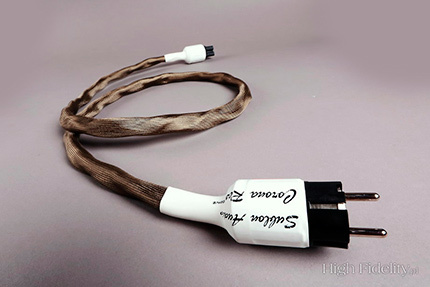 It turns out that tonality of that cable correlates with its character. The whole presentation, regardless of what recording we listen to, gets “ennobled”, sound is really beautiful and nice to listen to. If there are some serious issues with the technical side of the recording, like, for example, there is a large compression, listener will be informed about it but rather in the background, it won't be emphasized. What will attract attention will be a wide soundstage with amazing depth and richness. At the time of this test I expected parcels from USA and Japan, with the latest remaster of Roger Waters' Amused to Death. Audiophiles love this album as it is a great tool to test spacial abilities of audio systems. The spectacular surround effects were achieved on this album due to Qsound system, that is capable of coding full 360° environment/space into two channels. Although this is not the only album created this way – one should mention Sting's Soul Cages, Madonna's Immaculate and even Polish group Abraxas' 99 – it is Waters' album that utilized Qsystem to the best sonic and artistic effect. I expected two parcels as the American Analogue Productions released a 200 g LP and a hybrid SACD but Sony, in Japan, released same album on Blu-spec CD2 (plus BD) and hybrid SACD/BSCD2. To remind myself the album I listen to Japanese mini LP version from 2011. The effect with Sablon Audio was unique. But considering how sophisticated material it was good results were to be expected. The more impressive were the recordings without any special spacial effects and mono ones. Sound with this cable got amazingly spacial, but not through artificial enlargement of the images or whole soundstage, nor through artificial separation of the instruments. It was rather a very natural broadening of the “field of view” so to speak, mainly via smooth development of the perspective into the depth and width of the soundstage. Soundstage “grew” and so did instruments. The elements surrounded with a lot of space/air, even those from the front of the stage, were presented further away from a listener than in case of Acrolink and Harmonix. On the other hand these with small “pre-echo”, meaning presented up-close to the listener were actually presented close. Both range extremes were not particularly active. It is a cable that joins, not separates. It did not bother me – just a different way of presenting music. 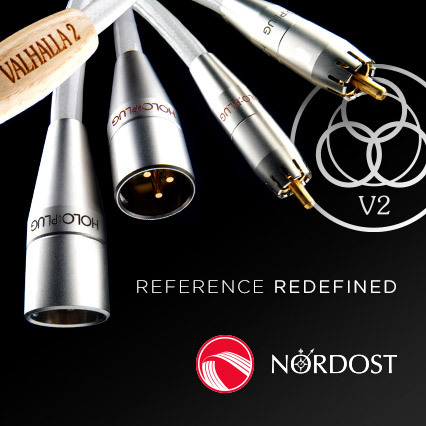 In many systems it will work very well adding a bit of a “vintage-like” sound, i.e. rich, saturated, focusing listener's attention on vocals, guitars and so on. And yet, it's not a warm sounding cable. What I described above was not a resulted of a “warmed-up” sound, nor of extremes roll-off. Such a smoothness and liquidity of a sound are possible only with a wide frequency range and high resolution. The general sonic character of this cables causes these sound features the express themselves via other ones and not directly. Tonality of this British cable puts is close to another European product, the Dutch silver-gold Crystal Cable Absolute Dream. They both deliver sound in a similar way due to how they convey spacing and attack phase. It is about focusing rather on the wholeness of the sound than on its details. Reserva is able to re-create complex spatial relations in a remarkable fashion which makes it also similar to both Harmonix cables - X-DC Studio Master Million Maestro (lang. Polish) and X-DC350M2R Improved-Version (lang. Polish). Harmonix cables offer more distinct sound though, with clearer leading edge and higher dynamics. Furutech NanoFlux-18E offers more open presentation. Going back to Acrolink Mexcel 7N-PC9500 brought me home: serenity, smoothness, coherence. Japanese cable takes these aspects of the sound even to a higher level than Reserva but it is also much more expensive.